On 2 November 2017, the Bank of England (BoE) raised interest rates from 0.25% to 0.5% – their first hike in 10 years . When interest last rose to 5.5% in July 2007, investors could generate a similar level of income from traditionally safer investments such as deposits and gilts. But generating the desired level of returns in periods of low interest is difficult, and this time investors will likely find it even harder to achieve their goals with traditional investments. Citi Analysts suggest that a multi-asset solution could be the answer, though this comes at higher risk and investors should manage this carefully. The recent interest rise hints at a UK economy recovering from a turbulent decade, featuring both a financial crisis and a secession vote from the European Union. 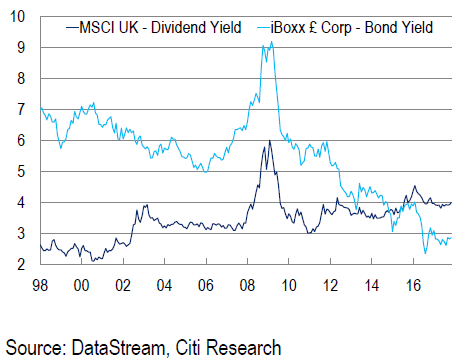 But as can be seen from the chart below, the yield on 10-year gilts has fallen significantly over the last two decades, and BoE rates are unlikely to climb much higher than current levels in the near future. Investors should also be aware that the next 12 months could see the British economy facing even greater volatility. Citi Analysts note that the BoE's decisions on the UK interest rate will likely be tested by the progress of Brexit negotiations – with more drastic economic effects to be expected should no deal be reached, or in the event of a last-minute solution. They also note that should the UK head down a path of deregulation, the BoE would likely counter by cutting interest rates. An isolationist stance could in turn be met with the opposite response. Those looking to generate an income from their investments are faced with two options – either reduce expectations or take a higher risk. The former may be a good option for those looking to protect their portfolios, while the latter could generate healthy earnings if it can be afforded. Should a higher risk option be taken, the overall portfolio should still be carefully balanced with a combination of lower risk assets. Even given the current environment, Citi Analysts believe that looking to equities and high yield bonds can still provide greater returns at a moderate risk. Desired income generation can be achieved through investment in income-focused multi-asset solutions. This type of portfolio could then be monitored and managed to deliver a positive return with a lower level of risk. To learn more about either this or any other solutions, please arrange a meeting with your Relationship Manager.